The snack part was the big one since he’s constantly asking for a snack, especially after he gets home from preschool. Obviously, we do lunch pretty much right away when we get home, but sometimes Baby H doesn’t allow for that to happen for some reason or another, so the snack drawer has come in handy to tide him over until I can get him lunch. Obviously, if he’s having a snack before lunch I want to make sure that M’s snacks are at least pseudo healthy. Even before Baby H was born, I started the concept of a snack drawer. I tried to buy big boxes of our preferred snacks and the separate them into little snack baggies. I had a hard time keeping up though, even before H was born, so I knew I would struggle even more after she was born. After H arrived, I caved and bought one of those big boxes of individual snack packs of Cheese Its and Teddy Grahams, it was easy and served the purpose at the time. Those were not my preferred snacks for his snack drawer though, so I went on the hunt for alternatives. I am now pretty happy with his snack drawer options. If you have a preschooler, more than one child, or want to promote independence, I can’t say enough how much I’ve loved having a snack drawer. It is so nice that when M asks for a snack, I can say, “go check your snack drawer.” He can open most of the snacks himself and if he can’t they’re easy enough for me to open for him while nursing H. It’s hands down, one of the best decisions I have made to help with M’s independence and to make my life just a tad bit easier. What are you waiting for? Go make a snack drawer! 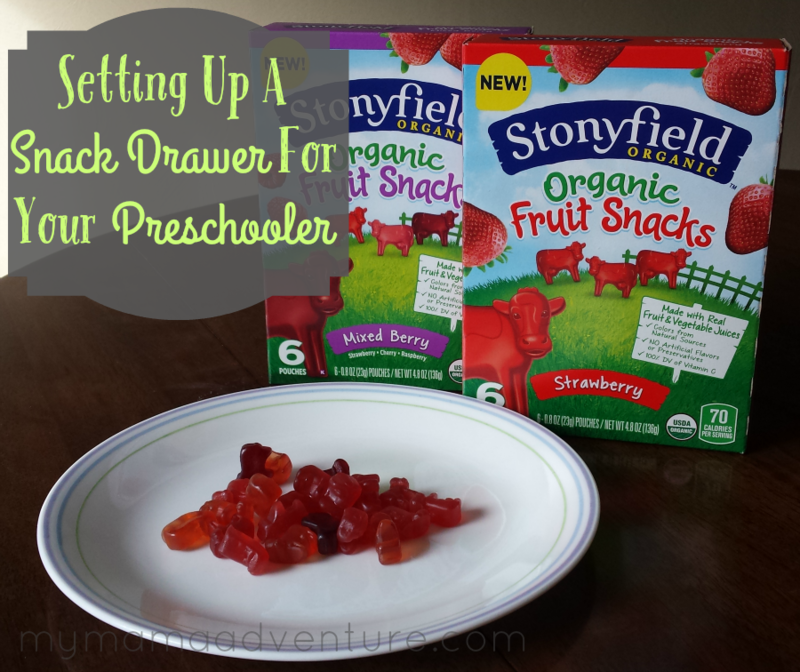 Snack drawers are great for regular kids too! I made a snack basket in my pantry for when the kids get home from school. they love it. A great idea for after school snacks! We don’t have a snack drawer, but we have a snack bin for our daughter. We try to keep healthy snacks in stock for her like organic granola bars, cheese crackers, and pb sandwich crackers. It is important to have good snacks on hand! I do love Stonyfield yogurts! I will have to look for their fruit snacks. They’re new, definitely keep an eye out for them! This is such a great idea! We have a shelf that we let Addie take food from, but to designate just ONE drawer is a way better idea! I think I will set this up this weekend with her fave yogurts and cheese sticks! Yay!! Hope it works out for you! My kids are out of preschool, but they have a snack bin set up in our pantry! They really like having fruit snacks to eat! Fruit snacks are so great for all ages…I love them too! When my son was little I set him up with a snack and juice drawer. He use to sneak the juices so I put them on the shelf instead. We usually keep some sippy cups of water, milk, and/or juice in the fridge as well so he can get to them easily. We have a snack drawer that’s easily accessible for our daughter. It contains items that I’ve already pre-approved, so it’s easy for her to pick out what she wants! We also have a snack space for the twins in our pantry. They love the Stony Field fruit snacks. I love the idea of a snack drawer! It’s a great way to allow kids to pick what they want while the parents still get some control over what types of snacks the kids have. Absolutely! We love our snack drawer. What a great idea to set up a snack drawer for kids where they can help themselves. Those cow shape fruit snacks I bet would be a popular treat to stash for them. Cow shapes are super fun!